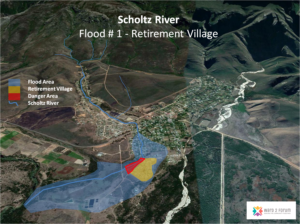 Pursuant to the Ward 2 Forum Flood Mitigation Proposal Document forwarded to TWK, for the Scholtz River, we finally have some good news in respect of the process toward finalising a overall Strategy for the whole river. An application for a non-substantial amendment to the above Environmental Authorisation (EA) is being lodged on behalf of the applicant, Theewaterskloof Municipality. We have been advised that the validity period of the EA for the proposed Scholtz River Flood Attenuation Measures for Flood Prevention, Greyton, has been extended.